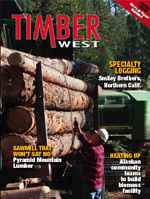 Steve Morris, owner of Steve Morris Logging and Contracting in McKinleyville, Calif., has weathered many changes in logging since he first partnered with his father, H. Hugh Morris, in 1976. (L to R) Mike Alcorn, chief forester for Green Diamond Resource Company, Dennis McCulley, Green Diamon forester, Steve Morris, owner of Steve Morris Logging and Contracting, and Kevin Daniels, driver for Morris. Together, father and son bought and sold timber and property. Eventually their operation evolved into a strong logging operation. When H. Hugh retired in 1983, he took most of the property. Steve kept the equipment and struck out on his own. Morris moved into contract logging and then mechanized logging in 1988. “We got all this mechanized stuff and an upgraded yarder all in the same year,” Morris says. But when the work dried up in 1989, he left Humboldt County. 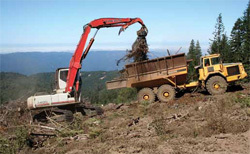 Morris sent half of his operation to Burney to work for Roseburg Forest Products, while he took the yarder and two Caterpillar (Cat) D8 46A tractors to Mendocino County to work for Gualala Redwood Company. Over the next several years, he logged all over California from the Sierra Nevadas off of Highway 50 to Los Angeles where he yarded Tanoak trees out of a landfill. While in Burney, Morris became acquainted with Gary Franklin of Franklin Logging, and Morris sold his mechanical side to him. In turn, Franklin got him into the clean chip business when clean chips were a hot item from 1994 to 1997. Morris purchased two 5000 Peterson chippers from Franklin and returned to Humboldt County in 1995 just as the clean chipping program fired up. That lasted through 2002 when the pulp mill shut down in Anderson, which was Morris’ main market for the chips. In 2003, Morris shut down, liquidated equipment, and cut personnel. He went from 40 summertime employees to just him, his wife Gwen, and his three sons, Todd, Sam, and Jake. Today, Morris has a successful biomass operation producing hog fuel for Power Plants. 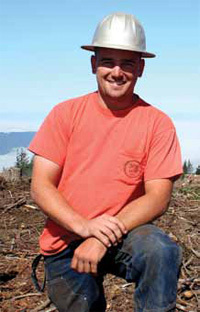 He has a team-oriented crew of 10 that are experienced and highly motivated — plus a cooperative and motivated landowner. He currently has a 2010 Peterson 5710C horizontal grinder, a 2001 Peterson 7400, and a 1995 Mobark 30 chipper. This spring, Morris tried out the new Peterson Knife Edge Bit, which he says works great on clean material. “It creates a finer material, and we’re about to get about a ton more per load.” When the material is more contaminated, he says they switch out to Peterson’s sharp carbide bits. Morris’ crew goes in after an area has been logged and grinds slash piles that were slotted for burning. He delivers the biomass to Greenleaf Power in Scotia, Calif. Doing this requires some unique equipment — from articulated dump trucks to all wheel drive tractors and chip trailers that are used to facilitate pre-loading and access steeper terrain and roads. This setup pays off as he is able to produce 20 chip loads per day. Mike Alcorn, chief forester for Green Diamond Resource Company in Korbel, Calif., says grinding has become a major part of their fuels management program, plus it is more consistent than burning. Broadcast burning germinates a lot of brush, whereas grinding reduces vegetation management costs by not germinating all the brush. Looking two to three years into the future, Alcorn foresees about 80 percent of their logging residue going through the grinder versus burning. Staying viable for Morris means keeping a low debt load, which in turn means he doesn’t have a lot of new equipment, other than his 5710C Peterson grinder. “We’ve got our shop there, and we’re pretty good at keeping our stuff up, and we’re running all 10-year and older equipment. But it’s dependable, it works every day, and it’s paid for, for the most part,” Morris says. Steve Morris uses a Peterson 5710C to grind slash piles into biomass. It’s one of his newer pieces. Morris bought his first Linkbelt 3400 about five years ago. He generally looks for bargains versus a specific brand, with the exception of the Linkbelt 3400s. “They are a really well balanced machine, and they seem to stand up,” he says. The articulated dump trucks are used to haul the slash piles to the grinder. Morris started with a Cat dump truck, then later purchased three more Cat dump trucks and two Volvos. He currently has two A35C Volvos, an A30C Volvo, and one Cat 300. Volvos have been dependable equipment for Morris as well. The Volvos ride better, which is easier on his guys, he says. Morris custom built these trucks to accommodate the steep terrain in Humboldt County. “We put these big high sides on them and an apron out the back. This has more than doubled the capacity on average, taking two to three dump truck loads per chip trailer load,” he says. Seven truck tractors — three Kenworth, two Peterbuilts, two Oshkosh. That includes three all wheel drive trucks that are used to pull the chip trailers up the steep roads. 25, 45, and 42-foot chip trailers, Western Peerless and Alloy, plus one 60-ton Cozad lowbed. Two Stellar hook lift trucks, one Kenworth, one Peterbuilt, and trailers with 30, 40 yard debris boxes for hauling slash and green waste. Water, fuel, and service trucks to support the operation. A 10-acre facility with shop, offices, and a biomass recycling yard. Slash being loaded to be transported to the grinder. Mike Alcorn, chief forester for Green Diamond Resource Company in Korbel, Calif., says grinding has become a major part of their fuels management program, plus it is more consistent than burning. Duplicate machines keep Morris operating more efficiently. When an operator finishes one site, a duplicate machine is at the new site ready and waiting for him. “The operator just gets in his pickup and drives over to the other unit, and the dump trucks drive over there, and they get started again. There’s no downtime,” Morris says. The dependability of equipment comes down to how you take care of it, and how you approach your maintenance program, Morris adds. Staying up and running is critical with the short season in Humboldt County, which runs from mid-May to mid-October. “You’re on borrowed time after the first of October,” Morris says, adding that such a narrow window to work makes it critical to keep equipment up and running.